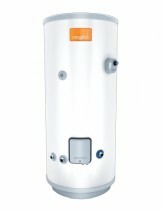 A hot water cylinder can be found in most homes across the UK. Hot water cylinders are commonly used to ensure copious amounts of stored hot water is available on demand for baths, showers and kitchen use. The hot water cylinder most suitable for your home will depend largely on how much water you intend to use throughout the course of a single day and the type of boiler system you have. Cylinders are divided into two main types – Unvented Cylinders & Open Vented Cylinders. See our Hot Water Cylinder Guide below for a full in depth view of Cylinders and hot water systems.